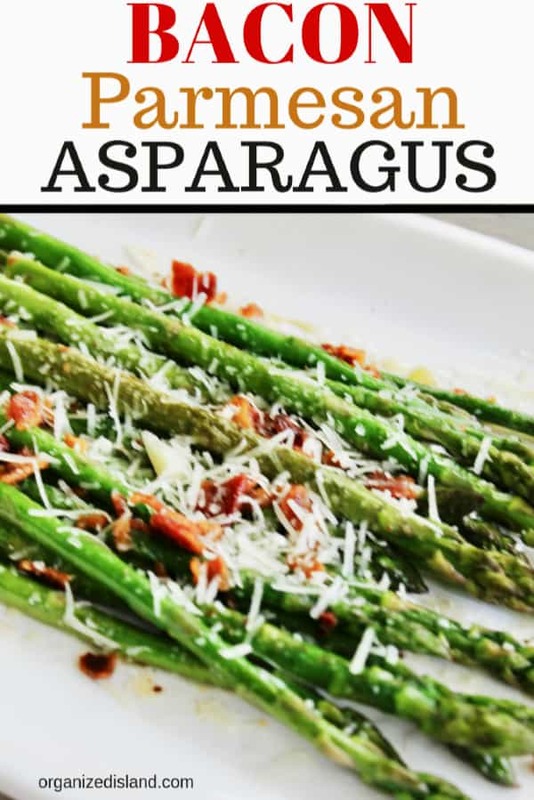 This easy Grilled Bacon Parmesan Grilled Asparagus recipe is perfect for a side dish for a weeknight dinner or holiday meal! 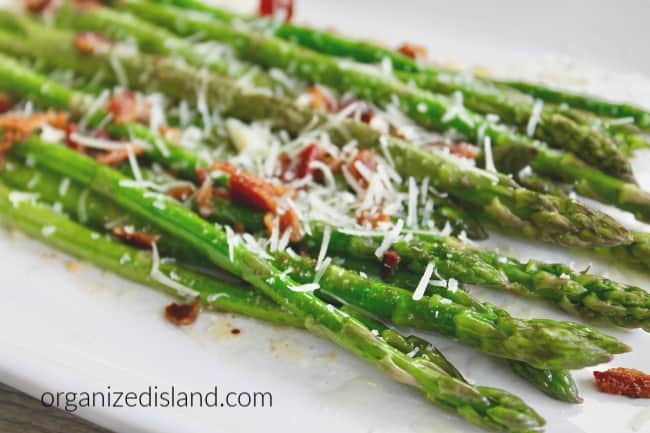 Made easily in minutes, these delicious grilled asparagus spears are ready in about 15 minutes. This post contains affiliate links. Hello Friends! How is your week going? We are enjoying the warmer weather of the season and were able to gather with friends this weekend. There is nothing like getting together with family and friends around the table to enjoy good food and good company. Today’s recipe is an easy one when you are looking for a tasty side dish to put together quickly. 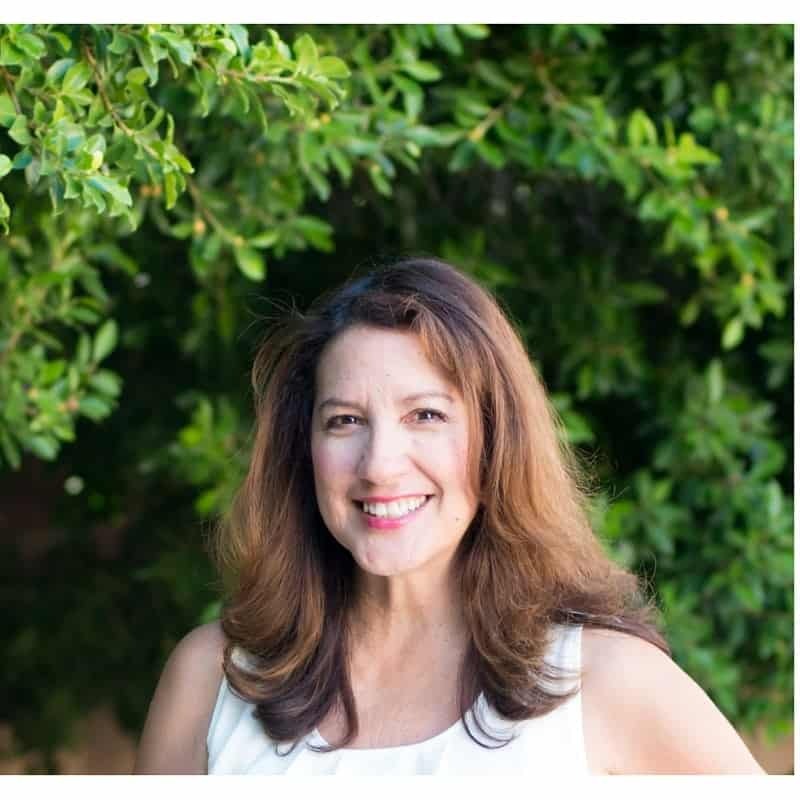 I love simple recipes like this one because I can use fresh produce, along with simple ingredients I already have on hand to whip it together with minimal cleanup. I also love the way all the flavors come together in a wonderful vegetable side dish just minutes. Asparagus is available year-round, but their peak season is spring. When shopping for asparagus, look for spears that are firm and their tips should be green and closed tightly. Asparagus can be grilled to lovely crispiness on the stovetop. I find them light and tasty and perfect as a healthy side dish for many meals. I like grilling mine on the stovetop with a grill pan. 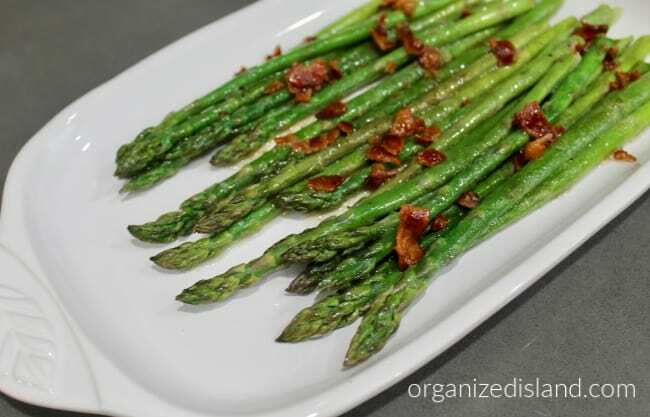 These delicious asparagus spears are wonderful to serve on their own, but adding a little cooked bacon bits takes them to the next level with little effort. I like to add a little Parmesan cheese to make the dish extra special. These are so good (and so easy)! Corn Salsa – A colorful salsa that will brighten up any dish. Creamy Cucumber Salad – A delicious cold and refreshing cucumber salad that makes the perfect side dish. 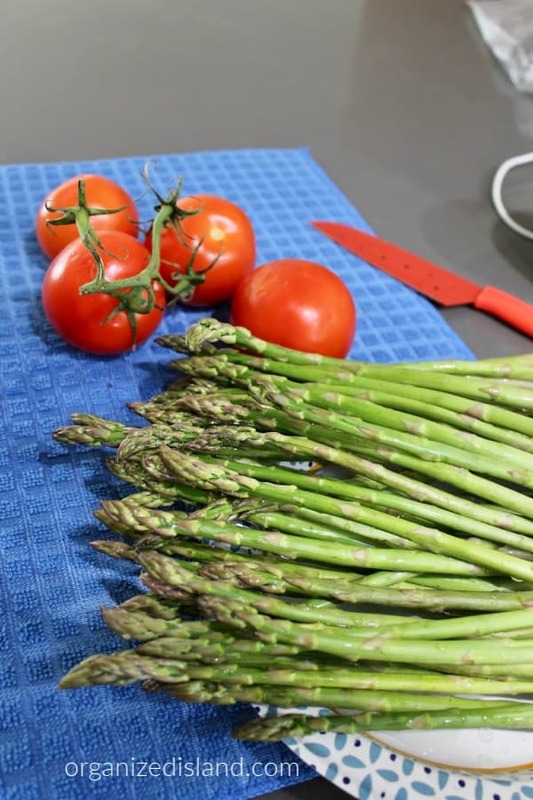 Before you prepare asparagus to cook, it is important to thoroughly rinse the spears with water to remove any dirt or grit. Shake the spears to release any grit that might be caught in the tips and rinse again. To prepare for cooking, snap off the bottoms of the stalks with your hands – about one inch from the end. You can prepare the spears the day ahead. After cleaning as described above, stand them on their ends in a glass of water. Cover with plastic wrap, and refrigerate. You can also cook asparagus in the microwave. Arrange the stalks with tips toward the center facing outward and add three tablespoons of water in a microwave-safe dish. Cover and cook on high for 7 to 10 minutes, or until crisp-tender. A delicious side dish for any meal. 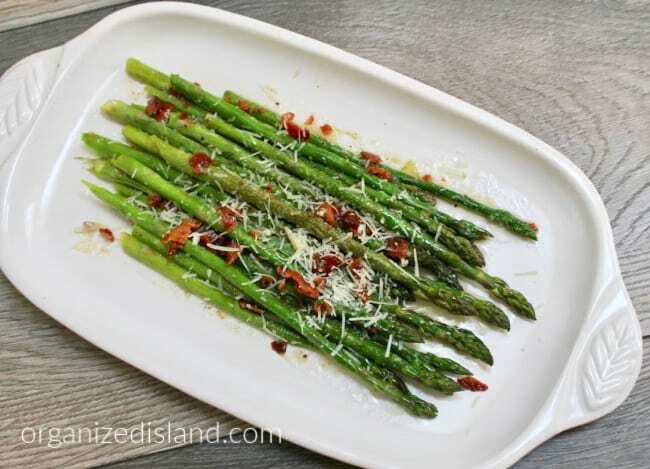 Freshly grilled asparagus with a crumbly bacon and Parmesan topping. Melt butter in a grill pan or skillet over medium heat. 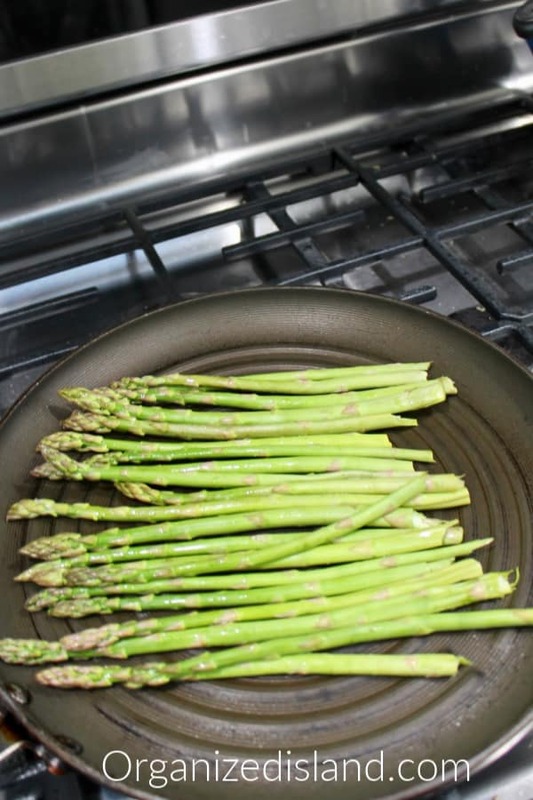 Place asparagus stalks parallel to each other against the grain in grill pan or skillet. Drizzle olive oil on asparagus. Grill 7-9 minutes, turning stalks every couple of minutes. Top with bacon bits and Parmesan cheese and serve. We hope you loved this simple and quick recipe idea. 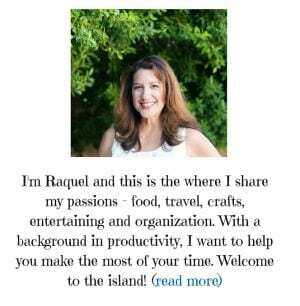 If you try this recipe or any other recipe on Organized Island, please don’t forget to rate the recipe and let me know where you found it in the comments below, I love hearing from you! So fresh and exciting! We grow asparagus here and it’s always one of the first crops, if not the first. And I once made bacon wrapped asparagus on the grill and it was AMAZING. I think the Parmesan here would make me thrilled. I love that you grow so many vegetables at your home. 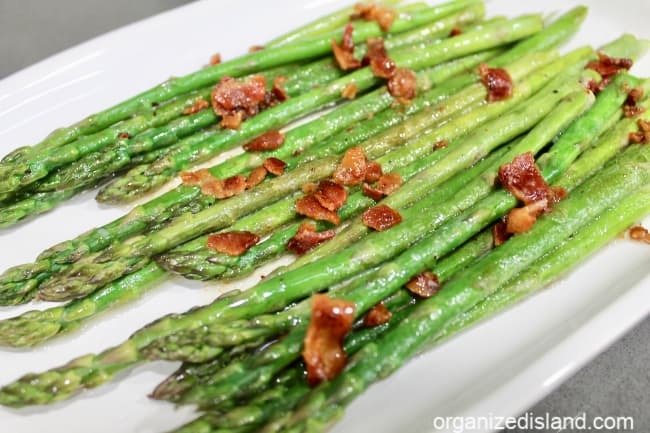 Asparagus is one of our faves! Cooking asparagus tossed in olive oil, salt, and pepper on a grill pan has been a favorite of mine. But I love the idea of adding bacon and parmesan!